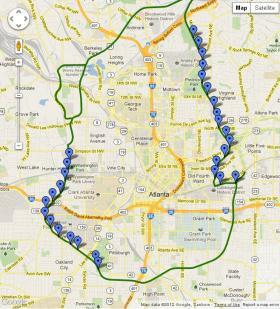 The federal government is giving the Atlanta BeltLine an $18 million boost. These funds will be used toward a 2.5 mile stretch on the BeltLine’s southwest corridor. “Anyway you look at it, it’s a tremendous win for the city of Atlanta,” says Atlanta Mayor Kasim Reed. The federal grant represents 42% of the entire price-tag for the project, which is estimated to be around $43 million. “It makes Atlanta a better place to come and visit for you, your friends and your guests when they’re in the city,” says Reed. An audio version of this story. Work on the two-and-a-half mile stretch was originally expected to take about five years. Reed says the federal funds will trim that down to two-to-three years. Supporters of the BeltLine are happy with the financial assistance from the federal government. “It gives people more of an opportunity to get out of their cars, be part of the community. I think too much of our time in the South is in a vehicle and people are less connected to each other,” says Greg Levine, the Chief Program Officers with Trees Atlanta. The BeltLine also helps the city show off an artistic side. “Sculptures, murals and different things along the line. So, you’re really able to immerse yourself in Atlanta culture and see what the artists are up to,” says freelance writer Muriel Vega, who lives near the area. The BeltLine is a former railway corridor that is being transformed into a multi-use trail. It’s also part of the city’s plan to help increase mobility throughout the metro area by the year 2030.